Colombian rebels freed two women held hostage for more than six years, handing them over Thursday to Venezuelan officials who flew them toward Caracas where a triumphant President Hugo Chavez awaited. The release of Clara Rojas, an aide to former Colombian presidential candidate Ingrid Betancourt, and former congresswoman Consuelo Gonzalez, was a major international victory for Chavez, whose leftist ideology has helped make him a key mediator with the rebels. 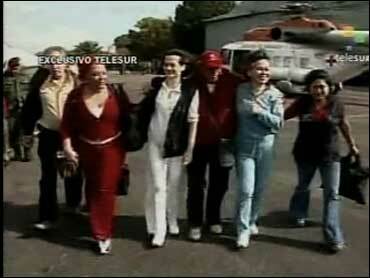 The Caracas-based Telesur network showed the two women smiling as they were freed by rebels in fatigues. "President, a thousand thanks for your humanitarian gesture," Gonzalez told Chavez on a satellite phone. "We are being reborn," a beaming Rojas told Chavez. The two - who appeared thin, though in relatively good condition - were flown by helicopter to an airstrip in the Venezuelan border town of Santo Domingo, where they were helped onto a small passenger jet that took off for Caracas. Chavez engineered the most important hostage release in the Colombian conflict since 2001, when the FARC freed some 300 soldiers and police officers. Chavez said he hopes the mission opens the way for the release of more hostages. "Venezuela will continue opening the way for peace in Colombia. We are ready, and in contact with the FARC, and we hope the Colombian government understands. I'm sure they will understand," Chavez said. "The world wants peace for Colombia." Rojas was kidnapped in February 2002 while campaigning with Betancourt in a FARC-dominated region of southern Colombia. Gonzalez was abducted by the FARC in September 2001 near the city of Neiva. Colombian President Alvaro Uribe authorized Venezuela to lead the rescue mission despite a bitter clash with Chavez over his involvement in Colombia's half-century-old guerrilla conflict. In November, Uribe abruptly ended efforts by Chavez to broker a swap of 46 high-profile hostages - including Betancourt and three U.S. defense contractors - for hundreds of jailed rebels. He accused Chavez of unauthorized direct contacts with Colombia's military. But relatives of the hostages urged Chavez to continue, and the FARC, which deeply distrusts Uribe, rewarded his efforts by offering to release the two women and Rojas's 3-year old son, Emmanuel - who was fathered in captivity by one of her guerrilla captors. That fell through: The FARC accused Colombia's U.S.-backed military of sabotaging the handoff with operations in the area, while Uribe's government said the guerrillas backed out of the deal because they didn't have the child hostage. Chavez immediately sided with the guerrillas, calling Uribe a "puppet" and "lapdog" of Washington. DNA tests later proved the rebels did not have Emmanuel, who has been in a Bogota foster home for more than two years. Still, Uribe's government bent to domestic and international pressure to open its airspace for the new Venezuelan rescue mission and suspend military operations in a Vermont-sized slice of jungle in southeastern Guaviare state, a FARC stronghold. Colombian Defense Minister Juan Manuel Santos said his troops held their fire as they saw the Venezuelan helicopters land just over a mile from where they were stationed, adding that troops would wait until sundown before resuming operations. "The minimum we can do is offer all sides the tranquility that we're going to respect all the ground rules," he said. Rojas elderly mother, Clara Gonzalez de Rojas, was overcome with emotion as she spoke to Caracol TV from Caracas, where she's been waiting for three weeks to be reunited with her daughter. "This is the biggest miracle God could have ever given me," Rojas said, holding back tears. "I'll be truly happy when I go with my daughter to retrieve my little grandson." Rojas said child welfare authorities assured her that Emmanuel "is in good health. He's a very loving baby, full of smiles, who inspires lots of tenderness - beautiful for a child who in his short life has had to overcome so much." The Bush administration, which has had tense relations with the leftist Chavez, welcomed the hostages' release and reiterated its call for the FARC to release all of its captives. "We're pleased that the Colombian government has authorized the Venezuelan government to send aircraft to Colombia marked with International Red Cross logos and carrying an international commission to recover the hostages," said State Department spokesman Gonzalo Gallegos. "We call on the FARC to release all hostages that it holds and we continue to support President Uribe's efforts to that end." Gallegos had no comment about Chavez's involvement in the release. French President Nicolas Sarkozy, who has pushed hard for the release of the French-Colombian Betancourt, said his country was "deeply overjoyed," adding: "This proves that things are moving, that the mobilization is bringing its first results. This commits us to boosting our efforts to bring the other hostages home." Yolanda Pulecio, Betancourt's mother, said she would fly to Caracas to see Rojas, and called the liberation proof that Chavez' methods work. "It's necessary for the guerrillas to show the international community they're really interested in the fate of the hostages," she said.